This January, DC Animation is spotlighting the occult heroes of the DC universe in Justice League: Dark. Like the team in the comics, this team deals with cases in the magical realm, cases that the main Justice League team isn’t adept at handling. 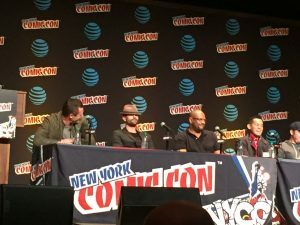 Executive Producer James Tucker, Director Jay Oliva, Batman voice actor Jason O’Mara, Constantine voice actor Matt Ryan and character designer Phil Bourassa held a panel on Saturday on NYCC’s Main Stage and also sat down with The Beat beforehand to talk about the upcoming animated movie. 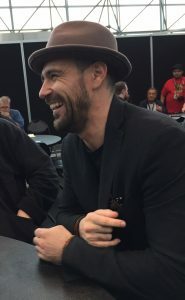 If Matt Ryan could play any other DC character? “Wonder Woman.” That’s right. Wonder Woman. You heard it here first. 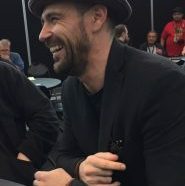 Speaking of Swamp Thing, Jay confided that “We were trying to do a Swamp Thing direct to video for years and it never came to be,” so he was very happy to be able to include Swamp Thing in this movie. Designer Phil Bourassa did about a dozen concept drawings when coming up with the look of Swamp Thing for the movie. “I was just having so much fun with it. Finally, I had one I really liked and that’s the one I pitched to James Tucker and DC, and that’s the one they went with,” Phil said. Would he change the look for a Swamp Thing solo movie? “If we were to do a solo film with Swamp Thing, we might take a different approach. With these characters, they’re the freaks and the monsters. They’re more off the wall and bizarre. There’s much more latitude, like when we’re introducing villains. but we turn it on its head because they’re the heroes,” he elaborated. 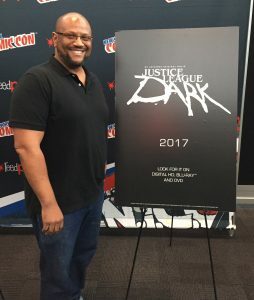 Executive Producer James Tucker with the promo poster for Justice League: Dark.